Standoff Ends Between Unmanned Cruise Ship And Railroad Bridge A cruise ship broke loose from its moorings, along with seven other vessels, and ended up wedged underneath a bridge connecting Albany and Rensselaer, N.Y.
A train passes over the Captain JP III cruise ship while it is stuck under a bridge spanning the Hudson River in Albany, N.Y.
"Bon voyage!" 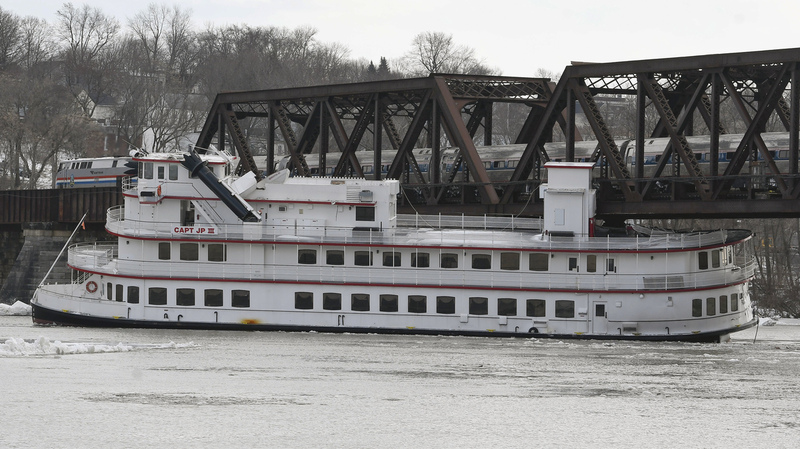 tweeted DEC Commissioner Basil Seggos Friday afternoon, as two tugboats moved the ship away from the Livingston Avenue Bridge, which connects Albany and Rensselaer. "Quick work by the tug crews— all in a day's work." Eight vessels broke loose from their moorings on the Hudson River Friday morning, amid rising water and ice jams, and floated south, according to the DEC. The department confirms to NPR that all of the runaway vessels, which consist of five barges, one tug boat, a "dock system" and the cruise ship, have since been corralled. A small fleet of tug boats put a halt to the breakaway attempt by the vessels on the southern side of Albany, close to the city's port, the DEC tells NPR. 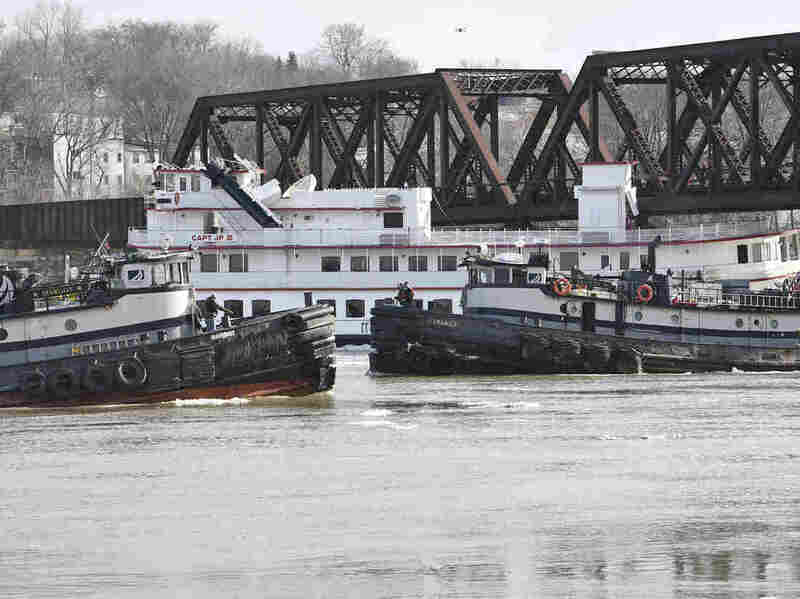 One barge's rescue required three tug boats performing what Seggos called on Twitter "a complicated maneuver."